Is G2A a Legit and Safe Place to Buy Game Keys? If you enjoy playing computer games, it’s likely that you’ve heard of G2A. G2A is an online marketplace connecting buyers to sellers of game keys and digital assets such as 3-D models and Steam skins. According to Alexa.com, G2A is in the top 1,000 most popular websites in the world. Much of G2A’s popularity comes from the fact that the website’s prices for game keys are among the lowest anywhere. G2A also attracts traffic with promotional products such as loot boxes. Buying a G2A loot box gives you a chance to win a game for well below its normal price. Got a question about G2A? G2A is an online marketplace that works similarly to eBay or the Amazon Marketplace. G2A provides the commerce platform and payment processing for sellers who want to offer digital goods. G2A doesn’t sell products; it facilitates the sales. G2A earns money primarily from payment processing and value-added services. Some people refer to G2A as a gray market website because most of the merchants are not game developers or authorized resellers. Although “gray market” may sound like a pejorative term, the term also applies to online marketplaces such as eBay. If you buy a watch on eBay, for example, you might buy from a private owner or a small business specializing in used watches. Either way, the maker of the watch doesn’t authorize the transaction and earns no money from it. Why Are Game Keys on G2A So Cheap? Downloadable computer software is a digital good that costs almost nothing to copy and distribute. As such, the cost of software can vary. Game developers often charge different prices to customers in different regions on the world because consumers in developing nations often have less disposable income than consumers in developed nations such as the United States. Some sellers on G2A take advantage of that fact by buying inexpensive game keys intended for developing nations and reselling those keys at higher prices on G2A. During events such as the yearly Steam Sale, G2A sellers will often buy game keys in bulk with the intention of reselling them. In some cases, G2A sellers may even negotiate directly with game developers to secure special prices for bulk key purchases. Sometimes, sellers on G2A charge low prices for keys because they purchased those keys with money that didn’t belong to them. In 2016, a Brazilian hacker used stolen credit card numbers to purchase game keys from the independent game developer MangaGamer. The hacker earned more than $500 selling the fraudulent keys, and he did not go to prison for the crime. Because the chargeback process can take up to 30 days to complete, some thieves have used G2A as an avenue for money laundering. By the time the chargebacks start happening, the thieves have already profited. In addition to losing $40 from each fraudulent sale, MangaGamer also had to pay its credit card processor $30 for each chargeback. The company lost thousands of dollars and was dropped by its payment processor. Some G2A sellers have obtained game keys by posing as YouTube personalities. Many of YouTube’s most popular channels feature game-related content, so developers will often provide free game keys to YouTube personalities in exchange for online exposure. In 2014, a game developer posed as a YouTube celebrity and asked software developers for free game keys. He received 16 game keys with a total retail value of more than $400. Hacking is another technique that some have used to obtain game keys. In 2014, developer Wadjet Eye Games temporarily offered free keys for one of its titles. More than 30,000 keys were obtained after the offer expired because some people exploited a flaw in the developer’s website. Yes, G2A is legit. A game developer cannot dictate where you can buy its products, and there is nothing illegal about buying a game key for less than the retail price. While a gray market website may sometimes circumvent a game developer’s approved distribution channels, buying a game key from a reseller on G2A is not illegal unless the reseller obtained the key fraudulently. Although a developer can’t control where its keys are sold, the developer does have the right to revoke fraudulent keys. Some developers have petitioned Steam and other game marketplaces to disable keys obtained through fraud. It is possible that you could try to load a game on Steam one day only to find that it no longer works. It is also possible that you could buy a non-working game key on G2A. Although G2A does offer some dispute resolution services to customers, the company doesn’t guarantee that keys will work or that they will never stop working. 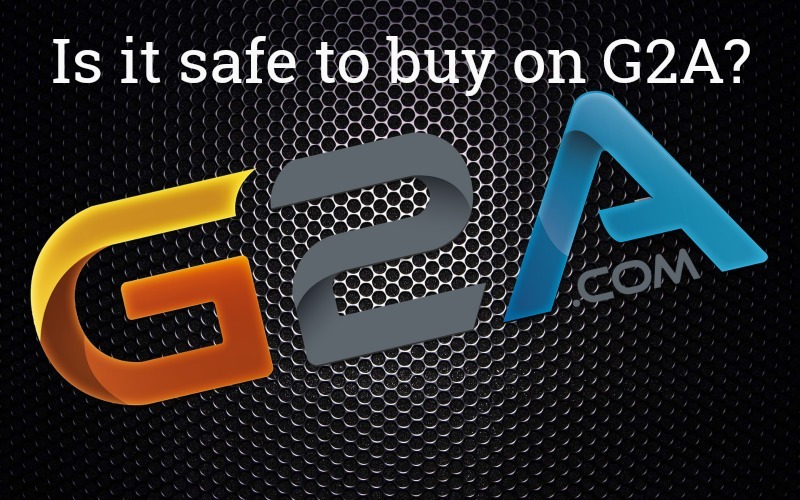 Yes, G2A is safe as long as you take the usual precautions when buying anything online from another individual. In this respect it is no different to eBay. When you buy game keys from G2A, there is no risk to your computer. On the G2A marketplace, you’ll find keys for major game platforms such as Steam and Origin. The games will not contain viruses. Buying from G2A does carry some financial risk, though, in that you may end up with a game key that doesn’t work or stops working in the future. Is G2A safe? G2A serves at least 5 million customers yearly, and most of those transactions result in happy customers. There are some online complaints, though, from customers who didn’t receive working game keys and didn’t get their money back. What Are the Risks of Buying G2A Games? The majority of the G2A game keys come from sales, bulk deals or online marketplaces intended for other regions. Buying keys obtained in any of those ways is legal, and there is no risk to you in doing so. However, some of the game keys offered on G2A may have been purchased with stolen credit cards. Fraudulent software keys are stolen goods. You do not have the right to own a stolen game key — even if you purchased the key without knowing its origin. Game developers have invalidated thousands of keys on G2A due to credit card fraud. What Can I Do to Keep Myself Safe When Buying Games on G2A? Although G2A has received many complaints from developers and customers about its selling practices, the company has taken steps in recent years to improve customer safety. In the past, sellers on G2A were anonymous. Today, sellers must verify their identities using their phones, email addresses and social media accounts. The best way to keep yourself safe on G2A is to check a seller’s history and feedback before buying. Like eBay, G2A allows you to see how many transactions a seller has completed. Customer feedback can help you determine whether the keys that the seller offers actually work. Although becoming a G2A Shield member may improve your experience as a G2A user, the program has received some criticism from people who believe that one should not have to pay extra money for improved customer service. In addition, some have criticized the G2A Shield service for being extremely difficult to cancel. Also, it is important to note that becoming a G2A Shield member does not give you fraud protection or assurance that purchased keys will work — it only gives you a faster response from customer service if you want to file a transaction dispute. What Is G2A Doing to Keep Customers Safe? As mentioned above, sellers on G2A are no longer anonymous. A seller cannot market games on G2A without providing his or her mailing address, phone number, email address and social media identity. G2A’s verification process greatly deters casual fraud. Although it may be possible to circumvent the process using throwaway phones and fake social media profiles, the same is true on any other online marketplace. G2A Shield may also help to improve the buying experience. Another recent change is that G2A now allows publishers to sell game codes on the G2A marketplace. If a publisher sells codes for a game on G2A, you’ll see that publisher’s listing at the top of the page when viewing that game. If you buy a game code directly from the game’s publisher, you can buy with certainty that the game code is valid and will not face revocation in the future. The G2A publisher program gives game developers the ability to earn revenue from G2A game sales. Whether a buyer purchases a game code from the publisher or a third-party seller, the publisher will receive 10 percent of the revenue after joining the G2A publisher program. With over 125 million active accounts, Steam is the most popular online marketplace for computer gamers. Game company Valve launched Steam in 2003 as the distribution and key verification system for the PC game “Half-Life 2.” Valve also uses Steam as service for matchmaking, cheating prevention and patch distribution for online games such as “Counter-Strike.” At the time of writing, there are nearly 25,000 products available for purchase on Steam. Steam is both a game marketplace and a digital distribution channel. When you buy a game on Steam, it becomes a part of your game library forever — even if you remove the game from your computer. Since Steam also provides matchmaking services for online games, finding others with whom to play is never a problem. Developers sell their games directly to buyers on Steam, so you can buy a game on Steam without fearing that the key might be stolen or fraudulent. The prices on Steam tend to be higher than the prices on G2A, but Steam has a large yearly sale during which buyers can purchase deeply discounted games. Kinguin is similar to G2A in that both websites use third-party sellers to provide their game inventories. As with G2A, you will not know the origin of any game key that you buy on Kinguin. Although most of the game keys available on both marketplaces are legal, publishers earn little or no money from the sales. If you’re considering Kinguin vs G2A when buying games online, you should generally buy from the marketplace that offers your desired game for the lowest price because the business practices of the two websites are essentially the same. Like G2A, Kinguin offers fee-based buyer protection that adds 10 percent to the purchase price of a game. With Kinguin’s buyer protection, Kinguin will “defend your purchase against fakes.” Kinguin does not explicitly state, though, that you’ll receive a refund if you purchase a non-working game key. The primary differences between G2A and Kinguin are that the marketplaces attract different sellers and therefore offer games at different prices. If you are not concerned about the origin of a game key that you’d like to buy, you can buy from either marketplace with the confidence that your game key will most likely work. Like G2A games, G2Play is an online marketplace on which you can buy game keys from resellers. Although the prices that you’ll pay on G2Play will generally be well below retail prices, you will not know the origin of any key that you buy. Many of the game keys on G2Play are legal in that they were purchased in other regions or during sales. However, there is a chance that some of the keys on G2Play are fraudulent and will not work. One difference between G2Play and G2A is that G2Play has a wide selection of game keys for consoles such as the PlayStation 4 and Xbox One. Purchasing a console game key on G2Play entitles you to download the game from the console’s built-in game downloading system. G2Play offers a promotion through which you can buy a random game on a marketplace such as Steam or Origin for less than the regular price. At the time of writing, random game keys on G2Play start at $1.06 each. G2Play does not guarantee that purchased keys are legitimate or will work. However, the G2Play FAQ section offers a potential resolution for buyers who purchase fraudulent keys. According to the FAQ, you should contact G2Play’s customer service team if a key does not work. You should attach screen captures showing the game key and the error message that you see when you attempt to activate the key. You should also attach a picture of your game library showing that your library does not contain the game in question. GOG began life as Good Old Games in 2008. As Good Old Games, GOG specialized in selling vintage MS-DOS games updated to run on modern Windows computers. Although GOG now sells a large selection of current games, the website’s library of vintage classics remains available. If you’d like to buy a game made by a defunct publisher such as Sierra or Origin, GOG is the game marketplace for you. Like Steam, GOG only sells game keys that publishers have sanctioned. You can buy on GOG without fear that a game key will not work. In addition, all GOG games are DRM-free. After you buy and download a game, you can play the game on any computer that you own. Unless a game has multiplayer features, it will function properly without an active Internet connection. Although GOG is less popular than Steam, it is one of the world’s largest game marketplaces. You can find keys for both GOG and Steam on G2A. As with Steam, many of the prices for current games on GOG will be higher than those on G2A. However, there is no chance of buying a fraudulent or stolen key on GOG. For me G2a & gamivo are same same. it’s more about the sellers than the websites. Thanks Chris, that’s a good observation, agree it is more about the sellers. G2A is a grey market site where you do not know where your keys are coming from. There is a reason steam bans G2A kinguin and other greymarket CD key sites on there forums, while allowing Legitmate Key Sites such as GMG and Gaming Planet. Stop telling people to use grey market key sites. Hi PanicFire, did you read the article? We are not telling people to use G2A, we’ve tried to be very clear about the risks so that consumers can make up their own minds. I bought a key from G2A, seller Zillakami on 3 February. I tried to use it, but was redeemed. I discussed with Microsoft and they sent me via email an evidence that the key was used on 1 February. Now the seller is not responding to my messages, and g2a says that is not their fault and can not help me. Hi Alin, sorry to hear about your bad experience. Can I ask what the sellers feedback rating was like? just notice the end of the URL an aditional “?aid=11924559”. Now the one without “?aid=11924559” is available and with it is temp down…. I have a technical question, I’ll be grateful to whom could answer it. Hi Marco, you know…you might be right. I think you could argue the semantics of the word but in the common vernacular “platform” is typically used to describe difference between PC, PS and Xbox. Thanks for pointing that out. A lot of the keys here are obtained by scams. People will impersonate big YouTube or twitch streamers promising reviews etc in exchange for keys e.g. on dodistribute.com. once they have their keys they immediately sell them on g2a. They didn’t pay for them and aren’t entitled to resell them at all as they are free for press use. A free market does not elevate these people above their license agreement. Hi Craig, thanks for the comment. Is this a wide spread problem? It’s definitely wrong but seems like that could only be a small number of people and a small number of keys because presumably they can only scam keys one at a time in this way? I don’t mean to discount the possibility this is the case, just curious if it is a big problem. G2A it self will scam you, I have fully deleted my account and removed my payment information but they still charge me and inactivity fee every month. I have to go to my bank to get this resolved as the g2a customer service ignores me or tries to claim that they haven’t charged me. DO NOT USE THERE SERVICE, they will continue to charge you for years to come for simply not logging regardless if you have an account or not!